It's not where you start. It's where you finish! Is Sweat Really a Reliable Way to Measure Exercise Intensity? One of the most sought after things in the fitness world is an accurate way to measure exercise intensity. People look to muscle soreness, exhaustion and all sorts of other tools, both absolute and relative to make sure they’re working out hard enough. A common feeling is that if you aren’t sweating, you are going to burn calories or reduce body fat. But is sweat really a useful and accurate way to judge workout intensity? A look at the purpose of sweat, as well as some of factors that effect how much we sweat can help decide whether or not sweat is useful for this vital part of out workout design. The human body has several ways to maintain a healthy internal temperature. Radiation is used to release heat through the skin into the air when the environment around you is cooler than your body. Conduction is a direct transfer of heat when you make contact with a cooler object, like swimming in cold water. Convection occurs when cool air, like from a fan, passes over your skin. The method that we’re looking at here is evaporation, in which sweat plays a key role. Evaporation is perfect for situations in which the environment is hotter than your internal temperature. This happens when your hypothalamus reacts to a rise in temperature by activating the sweat glands that cover your skin. These glands produce sweat, which absorbs the heat from your body and rests on the surface of the skin. When the sweat evaporates, you feel cooled. Whether we’re aware of it or not, we are constantly sweating and producing heat. Logically, our temperature rises when we exercise. But, much more than exercise controls the amount of sweat our body produces. Age, gender and fitness level all have a bearing on how much you’ll sweat. The most powerful factor that affects our sweat levels, however, is the environment. As mentioned, we sweat when the air around us is hotter than we are. When the air is humid, though, the sweat cannot evaporate. It collects on the skin until it begins to drip, giving the appearance of excessive sweating. Sweat, then, is simply the chosen method for lowering your body temperature in a hot environment. Sweat, especially excessive sweat, is a signal that your body is struggling to control it’s temperature and that you’re in danger of overheating and dehydrating. Try not to exercise in extremely hot and humid environments, since sweat can’t do it’s job under these conditions. Also, it’s always important to stay hydrated. Generally, the recommendations for hydration are to drink 1 to 2 cups of water two hours before exercising, a half cup to a cup during and 2 1/2 cups in the half hour following exercise. Of course, everyone is different and you should listen to your body. Drink when you’re thirsty and stop exercising if you feel dizzy and/or have trouble breathing. Sweat is, ultimately, an unreliable way to measure how hard you’re working out. Other methods, like rating your exertion on a scale of 1 to 10, while relative, can be much more useful. The connection between music and exercise is by no means new or surprising. In fact, the ancient Romans famously played simple rhythms on large drums to synchronize the strokes of the rowers on their ships. This makes perfect sense when you think about all the times that you’ve unconsciously found yourself tapping your toes to the beat of a song playing the background. Centuries of experience make it plain that the human body just naturally wants to move along with the rhythm of a given song. Understanding this connection and how to capitalize on it can give you a powerful tool in improving your workouts. Costas Karageorghis, Ph.D., a leading researcher on music and exercise told the American Council on Exercise that “Music is like a legal drug for athletes.” He also went on to explain that a properly selected playlist can both improve your endurance and lessen the perceived exertion during a workout. These assertions have been backed up by numerous studies which also shed light on various things to consider when selecting your workout music. One 2004 study published in the Journal of Cardiopulmonary Rehabilitation played various genres and tempos of music for the subjects who were asked to perform their normal cycling workout while their power output was measured. The study had some fascinating results in that the subjects’ output increased relative to the speed of the tempo regardless of the genre. The researchers paid specific attention to genres that the subjects were either unfamiliar with or didn’t enjoy at all. So, don’t be afraid to explore other genres of music when building your playlist. This is emphasized by 2010 study in the same journal which tried to dissect the music into its various aspects to determine which had the greatest bearing on athletic performance. The entire group of subjects was played a complete, unedited song and then split into three groups. The groups were then asked to exercise while they heard either the percussion track, a matching metronome track or a track with no rhythm elements. The subjects all performed the same whether they heard the full song, the percussion or the metronome. These results show that even though we might enjoy the musical aspects of a song, it’s really the percussion section that makes it an effective workout tool. Just like any other aspect of your fitness routine, you should use caution even when picking your music. Another study in the Journal of Cardiopulmonary Rehabilitation increased the tempo of music used in an aerobics class by as much as 33 percent. The patients increased the speed of their own movements in response to the music, even though their heart rates reached potentially dangerous levels. This study illustrates the importance of not underestimating the powerful influence that music can have on your workout. Make sure that you don’t push yourself beyond your current fitness level and choose appropriate music. 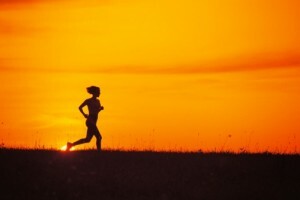 When you run, you do so at a certain number of steps per minute, also called your pace. This pace is easily comparable to the beats per minute (BPM) at which songs play. By selecting songs that have a BPM equal to your desired steps per minute, you can employ music as a much more entertaining and motivating coach. You should also try to pick songs that have a very strong, distinct beat so that you can easily match your steps with the rhythm. There are programs available that will find the BPM of songs you already have so that you can use those to build your playlist. But this has already been done for you by several free podcasts. The most popular of these podcasts is PodRunner. Each episode of Podrunner has a specific BPM so that you can follow along with the beat as you run. There is also an interval training program that will adjust your speed throughout your run. Try experimenting with different kinds of music until you find something that you really enjoy. The right music selection can make a drastic difference in your workouts. 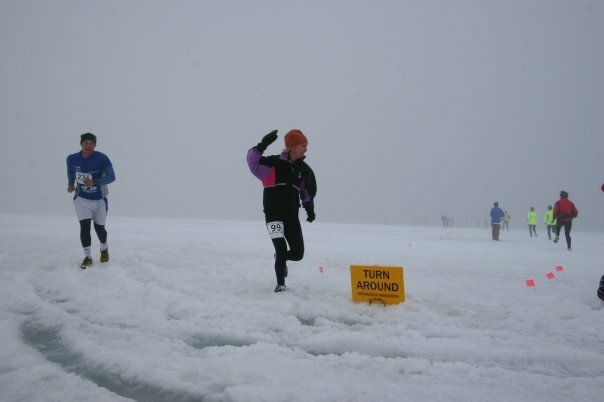 When I originally signed up for a marathon at the bottom of the world, I imagined visual wonders of penguins lining the course, blue glaciers to my right and left, and the sound of crunching snow underneath my feet. Falling into a mud pit. Near mid-race, I didn’t notice the treacherous mud pits looming right alongside the course. Veering off to the right instead of staying on the straight and narrow pathway, one step cost me several minutes. I lunged straight down into a deep pit with dark brown mud, formed from melting glacier water. No matter how I turned, I couldn’t find a way out. Remembering the sage advice from sedentary hours watching “Man vs. Wild” on the Discovery channel, I thought of Bear purposely falling into a mud pit and demonstrating how to hoist himself out using a stick as a fulcrum. I spun myself around like a sprinkler and found no sticks in sight. But I did have a water bottle in my hand–and that would have to do. I laid it on its side and used it as leverage to pull my body right out. Unfortunately, this meant I now drank mud instead of water and carried 10 extra pounds of mud-caked clothes. Climbing a glacier. In a battle of marathoner versus nature, nature won. It was without a doubt, the most difficult three miles I’ve encountered in any race anywhere in the world–we climbed up a glacier. I watched a man fall and break his hip, a woman sprain her wrist and bodies fly. I cautiously stepped very, very slowly and others assisted me when I slid. Hanging on to other runners, we all prayed our way up and down this glacier, taking 1:44 to complete three miles of the marathon. So much for a decent time. Sideways rain. Growing up in Seattle, I knew rain–every kind of rain imaginable. I didn’t know rain like this. At the South Pole, running in rain appears as if you’re moving through a vortex. Attacking birds. Instead of cute little waddling penguins along the course, we were met with skuas, aka, attacking birds of the Antarctic. To avoid a collision with these fellas, it was necessary to run with our arms over our head with water bottles in hand. Skuas land on the highest part of you and with arms raised up, the skuas landed on them and we beat them off with the bottles. Despite the insanity of this race, I highly recommend it. It’s a race impossible to forget and impossible to replicate. 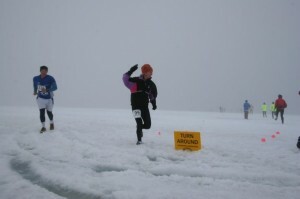 Each year is a different experience for runners. Shin splints, medically known as tibial stress syndrome, are a frustratingly common hazard for many athletes. In fact, athletes and regular exercisers aren’t the only people who are sometimes afflicted with this dull, throbbing lower-leg pain; you may have suffered with this even after just running to catch a bus. Since shin splints are so common, making up 13 percent of injuries in runners, it only makes sense to prepare yourself by understanding what they are, how to prevent them and what you can do to speed up recovery if you do find yourself with tibial stress syndrome. Is that pain in your calves shin splints or something potentially more serious? Typically, shin splints are identified by a dull, throbbing pain in the front of the lower leg which can surface during or after exercise. This pain can manifest itself either along the edges of your shinbone or deeper in the muscle. The area may even be sensitive to the touch. In some cases, the pain is constant. As with any persistent pain, you should consult a doctor to determine the exact cause. Shin splints aren’t really a medical condition, but are themselves a symptom of another problem. Overuse, working your legs too hard, is one of the more common causes of shin splints and is fairly easy to correct. Training your lower legs too hard or too often can lead to swollen and irritated muscles which will create the annoying pain we call shin splints. Flat feet and the resulting incorrect stride called overpronation is also a common cause of tibial stress syndrome. In these cases, the impact of your step flattens out the natural arch that your feet are supposed to have. This places an unexpected and abnormal type of stress of the muscles and tendons in your lower legs. Many people have flat feet and don’t realize it since the problem only become evident on hard surfaces like concrete or asphalt. It’s also possible that your body is using shin splints to warn you that you’ve suffered stress fractures without knowing it. These tiny, hair-line cracks in your bones can occur totally unbeknownst to you and require medical attention. Again, if your shin splints persist and the pain doesn’t go away after self-treatment, see a doctor to be sure you don’t have any breaks. It’s often been said that an ounce of prevention is worth a pound of cure and shin splints are no different. This condition, even if the pain is minor, can slow you down and keep you from running for weeks. Fortunately, prevention is fairly simple. Select running shoes that provide good padding and support a healthy stride. It is possible to have too much padding, though, which will encourage bad habits like heel-striking. Make sure that you’re landing on the middle of your foot and rolling forward onto the balls of your feet for push-off. If you do have flat feet, consider investing in some arch support inserts. Avoid running on inflexible, hard surfaces since these can wreak havoc on your arches. Take your time getting started and use a long warm-up, lasting between 5 and 10 minutes. Don’t forget to stretch, either, focusing on your calves and ankles. Finally, don’t push it. If you start to feel pain during your workout, stop running. Pushing through the pain will just cause more injury and possible make things worse in the long run. The best possible thing for shin splints, regardless of the underlying cause, is one that runners and, indeed, all athletes dread: Rest. While you’re giving your body time to repair the damage, though, there are things you can do to quicken the process. Primarily, try to reduce the inflammation by icing the shin for 20 minutes every 3 hours until the pain goes away. Anti-inflammatory painkillers like aspirin, naproxen, and ibuprofen can help but these medications come with side effects and should only been taken regularly if direct by your doctor. Arch supports may provide a quick-fix to the problem, but start out gradually and don’t get over confident if the pain goes away immediately. Work your back up to your standard training intensity. For more serious cases, your doctor may recommend physical therapy and various exercises. Just because you’re being forced to rest your shins doesn’t mean you have to be totally inactive, though. Low-impact cardio exercises like cycling, swimming or elliptical training can keep you moving while limiting the stress on your lower legs. I’ve completed over 100 running races and a familiar face has greeted me at the finish line in exactly three of them. As a single, childless woman, I don’t have a family of my own to offer support. I arrive and leave races alone. I don’t usually mind. 1. It’s too early in the morning. Yes, races start early. But it’s worse for me that it is for you. Not only do I have to get up early, but I also have to run 26.2 miles. You just have to show up in nice warm clothes drinking your Starbucks and stand. At a marathon finish line, I’m so slow that it’s not early in the morning anymore. It’s usually early in the afternoon. No excuse. 2. I won’t see you. I know some races have upward of 20,000+ runners. But I wear bright clothes. I’m 6’0” tall. I’m slow. I’m kind of tough to miss. 3. There’s nowhere to park. Then drive around and wait until someone pulls out. If you are coming to the finish line, I’m so slow I guarantee plenty of people have left already. 4. I stand around for hours and see you go by for a few seconds. I know running is not a basketball game in which you can watch a team play for hours. But the small support lifts my spirits when the pain is deep. 5. It’s boring. Yes, marathons are the worst parades ever. But for runners, it’s those on the sidelines that entertain us and put smiles on our faces. Think of it this way—you’ll make our day. 6. It’s too long of a day. Then just come to the finish line. I’m so slow, you’ll have your whole morning off before I’ll be done. Then you can carry my gear back to my car because I’m too sore to do it myself. 7. I hate crowds. By the time I finish, believe me, the crowd has disbanded. 8. Runners smell. Yeah, I have no comeback for that. 9. All the roads are closed. Then park farther away and walk. I have no sympathy for you. I just ran for over four hours. 10. It’s too cold or it’s too hot. Then wear appropriate clothing. In reality, whether family and friends witness my finish or not, I’m always just happy to accomplish another goal—even if it’s only the race photographer who documented it. Hopefully you aren’t like me and have a plethora of support at the start and finish. But if not, what excuses have you heard? Diet can make all the difference for the endurance athlete. Proper nutrition before a race will make sure that your muscles have everything that they need to function optimally while a healthy meal afterwards will help your body recover and repair itself. But what makes up a proper and healthy meal for the pre- and post- race periods? Let’s consider a few common dietary practices that can have a big impact on your performance, as well some principles that can help you design healthy meals. Since most races take place in the morning or early afternoon, your breakfast will in fact be the most important meal of the day. Sports nutrition experts at the Colorado State University Extension recommend having a light meal about three to four hours before the event. This should allow your body enough time to break down your food and make sure the nutrients get where they need to be. Your stomach should also have more than enough time to settle so that you don’t experience any digestive upset during the race. All told, your pre-race meal should consist of about 500 to 1,000 calories depending on the length of your race. Obviously, a 5k runner will require much less fuel than a marathoner. The majority of your meal should be made up of starchy, complex carbohydrates like breads, pasta, cereal, fruits and vegetables since these break down more easily and provide constant energy over a longer period of time. Avoid foods that are high in simple sugars and fats since these can both cause an upset stomach. Simple sugar can cause a spike and subsequent fall in blood sugar which, instead of giving you a boost, can limit your overall energy. The Colorado University also points out the importance of eating foods you both enjoy and tolerate well. Before the race is not the time to experiment with new foods that can bother your stomach. During your training leading up to race day, you can try a variety of foods to figure out what works best for you. Of course, proper hydration is important before your race. Drink about 64 ounces of water but don’t drink anything at least 30 minutes before the race to avoid discomfort. Coffee or any other form of caffeine is a bit of a controversial topic for endurance athletes. Caffeine is a diuretic, meaning that it can lead to dehydration but many studies show that small amounts can actually improve your performance. Again, experiment during training to see how your body responds to caffeine. The recommendations for the post-race meal are the same regardless of age, gender or sport. Everyone will benefit from a small meal containing carbs, fat and protein within a 30-minute window after the activity. During this time period your muscles are starved for glycogen fuel and protein synthesis is at its peak so making sure you have these nutrients will jump-start the recovery process. For some athletes, it can be difficult to have a meal this soon after an event without upsetting their stomach so other options may help. A high-protein, high-carb drink will give you everything you need while putting little to no demand on your digestive system. Carbo-loading, eating a large amount of carbohydrates before a race, is a common feature of fitness lore. This practice is based on the understanding that carbohydrates are the body’s primary source of fuel, accounting for about 40 to 50 percent of energy production, especially during intense activity. To understand the problem with this theory, it helps to compare carbohydrates to a car’s fuel. That fuel is stored in your muscles and liver, which are sort of like the body’s gas tanks. Just like a literally gas tank in a car, your muscles and liver can only store a set amount of fuel. Many studies have demonstrated that not only is carbo-loading useless to runners, it can actually slow you down. A good, healthy meal on race day can help you to perform your best and recover in a way that will leave you even faster and stronger. As a runner, excessive amounts of my hard-earned money disappears at the click of a registration button. Although my body loves to run, my checking account does not. Yet I continue to spend thousands on my passion and prefer this over purchasing expensive cars and extravagant furniture. My friends don’t understand it—they drive Beemers while I drive a Kia SUV, which I picked because it was cheap and large enough to haul my racing gear. They buy furniture at European boutiques; I buy at Ikea, my version of a European boutique (it is Swedish). I get it—they think I’m crazy and I agree. A new pair of running shoes for $100? No problem. A new pair of pumps for $100? No way. I subscribe to the notion that it is better to feel good than to look good. Good running shoes come with a price and after 26.2 miles, that price practically pays for itself. Fancy shoes with high heels are simply not comfortable and they certainly don’t assist me in crossing any finish lines. Quality running clothes lessen the chafing and offer breathability. After running three plus hours, this makes an enormous difference in how I feel. I also (try) to run four to five days a week, but I might wear one particular dress once or twice a month. Do the math. I live by gels. As someone who gets hungry often when I run, I go through boxes of gels frequently. I could easily spend $60/month on gels and sports drinks. Yet a waiter slipping me a $60 bill at an upscale restaurant? My credit card bill slips into hiding. Registration fees skyrocket each year so I carefully research the cheaper races and sign up even hours before fees are raised. But clip grocery store coupons? That’s too much work. I loathe paying for parking at races, as I feel that is money offering no return. I arrive early to find free parking, even if it means walking an extra mile in addition to the 13+ miles I’m about to run. I do the same as #5 for long runs on trails that charge a parking fee. I leave my car farther away and add in that distance to the trail as part of my long run. Who knows what my health bills would be without physical fitness? I get shirts at races, sometimes even visors and jackets. That’s cheaper than purchasing them at department stores. Running is a good anti-depressant. Although most agree my priorities are quite skewed, other runners no doubt understand. Spending money on running is money well spent. What do you give up to spend money on running? Should You Use Your Smartphone When Running?